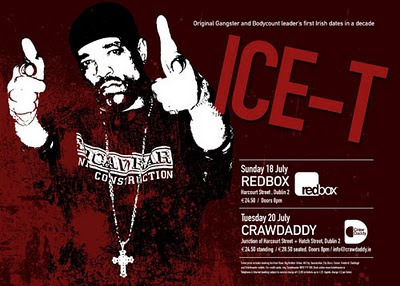 Ice-T, the original gangster, doing two nights in Dublin back in 2004. One big gig and then a small club gig. Would have been cool to see him in the 350 capacity CrawDaddy. I thought this poster was pretty good at the time, but I look at it now... ugh, it's awful. Here's a poster from 2008. Its for a big three-room dance night. The brief was to get across that there is loads of stuff going on, obviously the hands represent the three rooms. Pretty basic stuff but I've always liked this one. 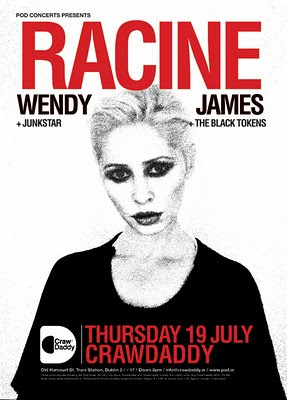 Back in 2007, Racine played a gig in Dublin. Here's the ultra simple poster for it. 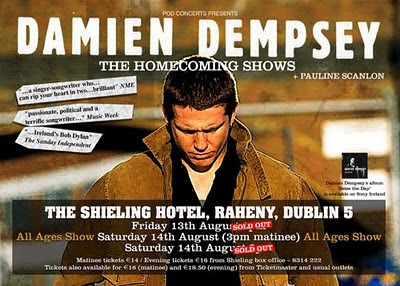 In 2004 Irish, I suppose, singer songwriter Damien Dempsey did a few gigs in a hotel in North Dublin. He would have been a regular in Whelan's and I think he might have been playing in Vicar Street around then too so quite unusual for someone in his position at the time to do this. Here we go, an old one, this is from 2001. 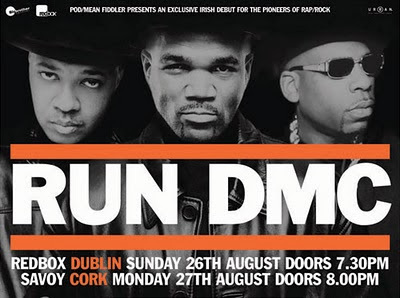 Run DMC playing Dublin and Cork back in the day. This is another 2 colour billboard poster, not sure why all the ticket details are missing from this file. Or why RUN DMC is not centered between the two red lines! For a little while I was doing billboard posters in full colour, this is one of them. 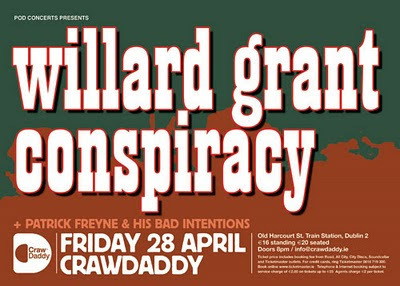 Grant Willard Conspiracy from April 2006 supported here by Patrick Freyne, he ex of National Prayer Breakfast and El Diablo and now writing for one of Ireland's national newspapers, I can't remember which one. Anyway, they were a good band, Patrick is a good songwriter. 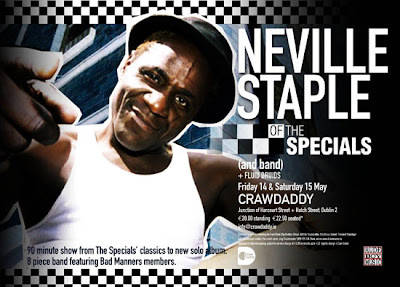 And old one, from 2004, Neville Staple of the Specials did two nights in the newly opened CrawDaddy. 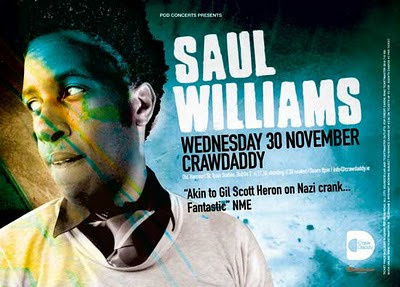 ... and here's Saul Williams again, this time from May 2008. This was full on Niggy Tardust which was the album he did with Trent Reznor that was famously available for free or a $5 voluntary price. Good stuff. Big push at the moment to get Ted Leo to win the music section of the Shorty Awards. At the moment he's at no. 2, right behind Britney Spears. "A battle for the ages" as Scharpling said. If you're on Twitter, vote Ted! I've posted the A3 version of this one before but here is the billboard version. It's from 2008 and it's the only one of my posters I have up in my office. 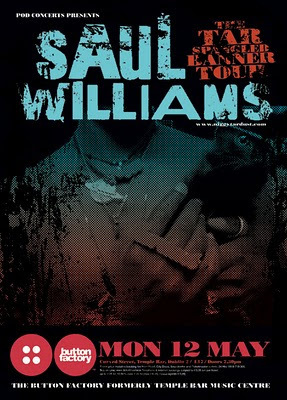 Here's a Saul Williams poster from 2005. This was before the days of Trent and Niggy. I heard last night via Twitter that Jay Reatard has died. Really sad stuff. 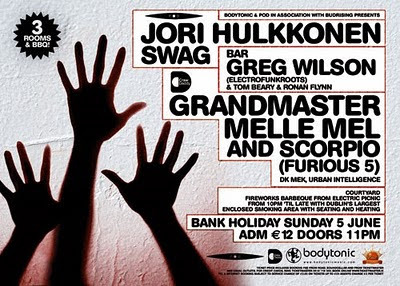 Here's a poster from November 2008 when Jay was playing during the Green Synergy festival. This show didn't actually happen, it was postponed, I must say I was glad at the time because this quickly done poster is really poor. I just set up a Soundcloud account for the Large Mound. I'm just testing out the whole thing so when this has finished processing you should be able to listen to the song Rubbish Coffee right here. Brand new one today. 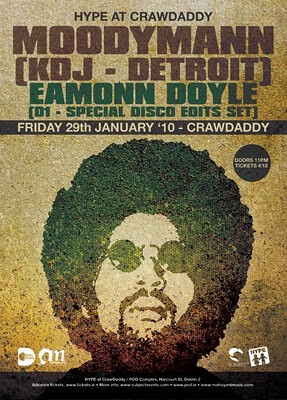 I put this together for Subject who are having Moodymann play at one of their regular Hype nights. Large Mound and Flying Eyes Irish tour poster from 2007. LM is of course the band I play in and FE are a band from Toronto with my brother on drums. Posting this because I got the news that Flying Eyes are getting back together! The poster was a bit of a laugh to do. It was a deliberate attempt to do something in the style of Maggie Taylor, pretty poor attempt but still fun. 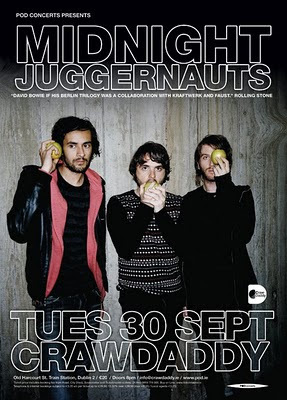 From September 2008, Australian band Midnight Juggernauts playing in Dublin. Poster is nothing to write home about but is tidy and tight. Grand. About the most mainstream thing I've done. 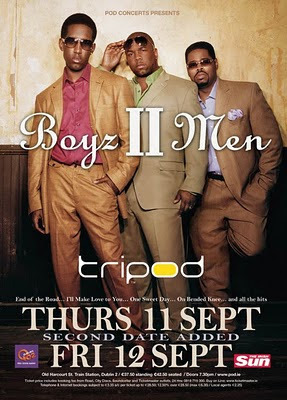 In 2008 Boyz II Men played two nights in Dublin, here's the poster. Guess what? I get to do it all again, they're back this May. 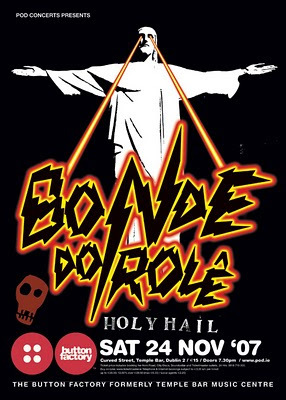 Poster for Brazillian band Bonde Do Role from 2007. They had played Dublin a few times before, this time they were promoting their Domino album With Lasers. The poster is based on that album cover but made from scratch. Their logo was very easy to redraw and the statue is just a stock photo, probably the same one used on the album cover. But, yes, the elephant in the room.. that outer glow. I'm not proud. Oh, I think this gig was actually cancelled in the end because someone left the band. I see they're a 4 piece now. 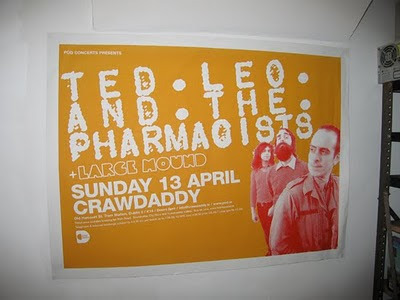 Irish band poster from 2001, well not quite. 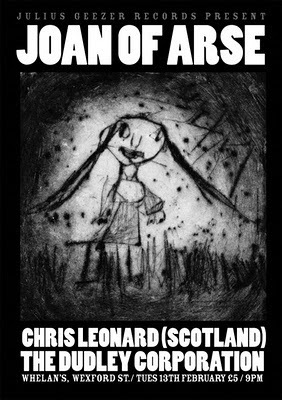 This was a poster from 2001 for Joan Of Arse. I just did a little bit of reworking on it, they would never have allowed their name to be at the top like this. Plus the original was done in the days of bad photocopiers so it was mainly white instead of black. The illustration was an etching by a then very young Nicole Murphy (now studying art in Galway). I dug this out because I was thinking about Irish albums of the decade. Trying to narrow that one down was turning into a stupid long post with multiple albums by the same bands, like, how do you choose between 3 Corpo or 3 Rednecks albums? So just quit the crap and post ONE. 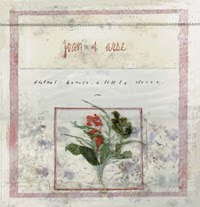 Joan Of Arse, Distant Hearts A Little Closer (2001). My Irish album of the decade. A band on top of their game. This is full of ideas and hard work. They bit the bullet and went to Chicago to record it with Albini and did it. They even did two albums worth of recording that weekend, the second still hasn't been released. I haven't seen this mentioned anywhere else in decade round ups. You people should be ashamed of yourselves. Find this and buy it. First post of 2010 with the first poster of 2010. 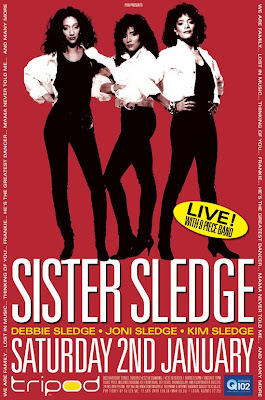 This is for the (postponed) Sister Sledge gig was was due to happen a couple of days ago in Dublin. This had a tough birth. I think this was the third version. Their new press photos where tricky to work with. In the end I think we got the right disco/80s thing as well as keeping sponsors happy. I warmed to it. Pity it got postponed, not sure if we'll use this for the new date.